Latin America is a general term applied to the 20 Independent Republics of the new world with a Latin background. Those Republics are: Argentina, Bolivia, Brazil, Chile, Colombia, Costa Rica, Cuba, Dominican Republic, Ecuador, El Salvador, Guatemala, Haiti, Honduras, Mexico, Nicaragua, Panama, Peru Paraguay, Uruguay and Venezuela. Half of these countries are on the mainland of South America. Geographers, especially, include in the general expression Latin America, the possession of the European States in the hemisphere (the three Guianas, Jamaica, Trinidad and British Honduras – Belize), since all of these areas were once claimed by Spain. Puerto Rico, a Spanish colony for four centuries but now a part of the United States, may also be included, under the term Latin America. 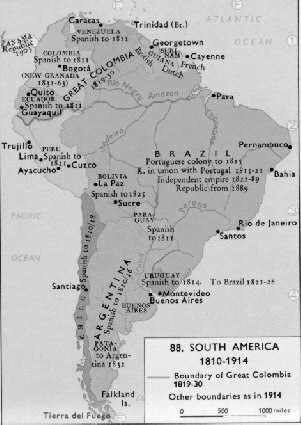 In 18 of the 20 countries Spanish is now spoken; Portuguese is the language of Brazil, and French has been used in Haiti since it first became a French colony. Paraguay, because of the great number of Indians, also uses Guarani as an official language. The ethnology of Latin America differs from a region to another, according to the peculiar history of each and its predominant social and economic character: industrial-urban, industrial-rural, pre-industrial Iberian or pre-industrial nature. Cultural traits of the Indians, Europeans and of the North American whites, Asiatics, Blacks and Mestizos. Mestizo culture is heritable literacy, printed matter, Roman Catholicism, the monogamic family of the conventional European type, a money economy the Republican form of government, European costume, clock-measured time, European tools and other technology, foods, domestic animals and some crops the plaza play for towns, official male dominance, a double standard of sexual morality, domestic architecture and concepts of personal honour. Mestizo culture is distinct from North American culture in its emphasis on traditional forms, the Indian words and traits it adopted, feudalistic European survivals from Spain, mysticism and medieval scholastic intellectual patterns regarding the sexes, the family, the political forms and economic activities. Ideologically, it is humanistic rather than puritanical; Intellectually, it is characterized by logic and dialectics rather than empiricism and pragmatics; it assigns great value to the manipulation of words and other symbols; it emphasizes ‘form’ and ‘symbol’ rather than the ‘thing’; it has a ceremonial kinship system of “ god-parenthood ”, the extended family functions as a unit in political, social and business affairs. Blacks : while there are scattered concentrations of blacks and mulatto populations in most of the Latin American countries, (particularly in the port towns) Haiti, which is almost 100% blacks, Cuba, Trinidad, the Dominican Republic, British Honduras – Belize – and Brazil are where the Black population is heavily concentrated. In Latin America there has been a widespread correlation of landownership with social class, the large hacienda or owners of plantations being socially on top, small landowners and share croppers next, day labourers and squatters at the bottom. Organized movements designed to improve the welfare of the people and the social services available to them, are of the utmost variety. In this respect, the various countries have little in common except that the developments are recent, significant groups are feverishly at work, and the difficulties confronted are tremendous. Nations which have experienced little social change prior to World War I, and comparatively little before the end of World War II, are the scenes of intense activity designed to improve a lot and increase the security of the population. The rapidly changing status of women throughout the Latin American countries is another striking development taking place during the second half of the twentieth century. Until the close of World War I, and in many parts of the area, even later, the rights and privileges of women in Latin America resembled those of the middle ages of western countries. The women of the lower classes shared their mate’s service or semi-servile status, and those in the small middle and upper classes were under strict surveillance. As children and adolescents married young and were limited largely to careers of childbearing and homemaking. Formal education was almost entirely confined to women of the upper classes, and it was most frequently by private tutoring or in a convent school, with limited subject matter to that considered befitting a wife and mother. During the second quarter of the twentieth century, noticeable changes in the status of women began to occur, and in the third quarter these were progressing rapidly. The development of industry and the expansion of trade and commerce is creating thousands of new kinds of jobs in offices and shops. In Spanish America, federalism was usually supported by liberal parties and associated with proposals for reform which appeared to be radical – especially those aimed at the church and at economic policy, rather than by conservative parties as in North America. The Democratic movement was handicapped by political traditions and ethnic heterogeneity. The spread of democracy seemed to imply ‘social revolution’, the old ruling groups often formed political alliances with military adventurers who seemed able to restrain the popular tide, yet inadvertently contributed to its growth. The amount of social and labour legislation placed on the books already is enormous, and it is steadily increasing. Efforts to improve health and sanitary conditions are being extended from the cities to remote rural districts; there are widespread efforts, both public and private, to provide housing for the masses and women are gaining a status closer to that of their sisters in western nations. In all these developments, the efforts of the Latin Americans themselves are being encouraged and, to a degree, supported, by the Organization of American States, the Agency for International Developments, European Economic Community, the Bank of International Development, the United Nations and other supporters.